The theme this week (starting Friday Dec. 7) at the Bento Blog Network is copycat. I was inspired by bentoriffic’s – CuteZcute panda lunch and decided to copy her sandwich and clementine. I was also inspired to put a grain behind the sandwich (I placed a piece of foil in between the bread and couscous). Thank you Sarah! I enjoyed copying your lunch. Panda Sandwich: Wheat bread peanut butter sandwich with Wegmans Fruit Flats (details). The CuteZcute cutter is available at Bento USA by All Things For Sale and on Amazon. This was my first time using the CuteZcute cutters. They are quick and easy to use and the results are so cute! 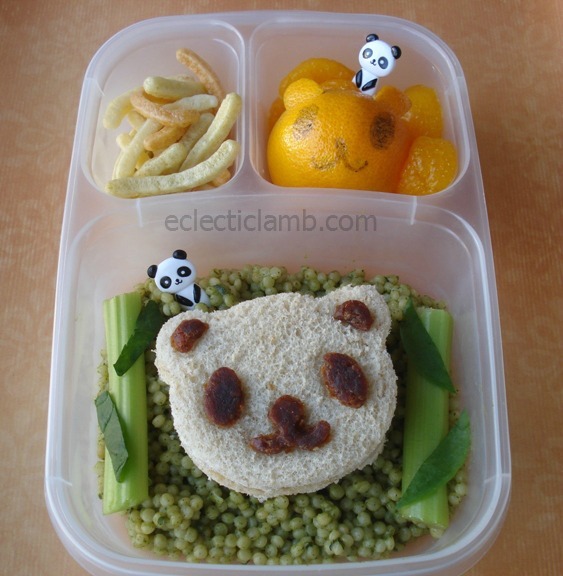 This entry was posted in Bento / Cute Food and tagged CuteZCute, panda themed food, vegetarian. Bookmark the permalink. That celery bamboo is genius! Thank you! It was a last minute idea. Awww! Thanks so much 🙂 I ADORE the green cous cous & bamboo look. FAR more creative than my leftovers. Thanks for the compliment. Thank you so much! It was fun to make your lunch. That is soooooo cute! I love it! How do you eat these after you make them? Sooo cute!! Thanks! I try to make sure I like the photo before the lunch is eaten. I love having a blog for an archive. LOVE the bamboo! Thanks for linking up! What happy pandas! Cute lunch!